If you are a Skynet user, it is very likely that you are sick of having to use the awkward telnet client which comes with Windows. One of the most frequent complaints is that the window is much too small to be practical, extremley tedious to perform such a simple task as 'copy-and-paste' and the lack of colour. You may also worry about security issues. You will be very glad to know that there is an alternative out there. 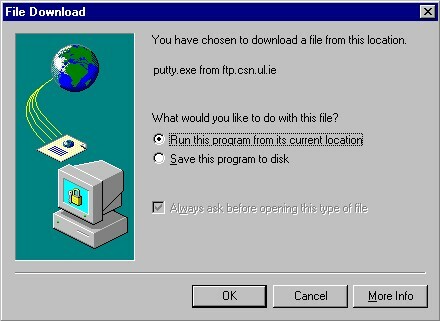 PuTTY, fundamentally, operates in more or less the same way as telnet. Below is a step by step guide on how to install and use PuTTY. Note: there is no help available for the latest version on this website. (For help on this version, check here ). 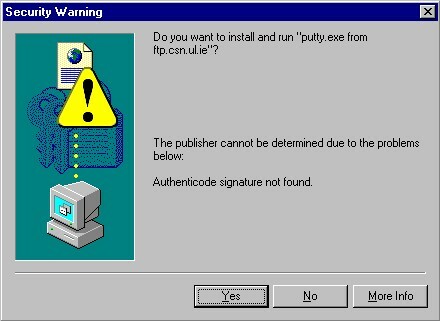 3: Select 'Run this program from its current location' and click 'OK'. 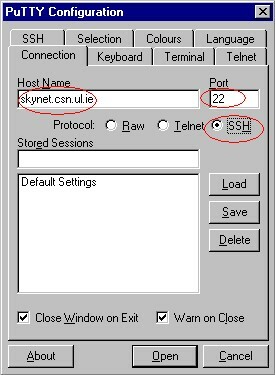 7: Into 'Host_Name', type 'skynet.csn.ul.ie' - as shown. Make sure that '22' is in 'Port' - as shown.
" Passwords can be easily sniffed when connecting with telnet. SSH connections are encrypted." So essentially, use the SSH protocol whenever possible. However, if you really, really, really want to use the telnet option, make sure you enter '23' into 'Port'. 9: Finally, click 'Open' and you're all set! You can now use PuTTY in the same way as you would normally use telnet. The first obvious advantage of using PuTTY is that you can resize the window. This makes it much more comfortable to use. It is very simple to 'copy-and-paste' too. To do this, use your mouse to highlight the text which you want to copy (don't click anything). Then position the cursor where you want the text to appear and 'right-click'. The text will be pasted into position.